LinkedIn is now catering to college students, as the social network for professionals has introduced new tools to help students overcome common obstacles like finding the right college to attend or discovering the best subjects to study. For starters, LinkedIn has unveiled a new feature called Decision Boards that aims to help students find the right school and major. With Decision Boards, students can leverage a combination of organizational, social and insight tools to share their thought process with advisors, meet future classmates and make decisions about their education. 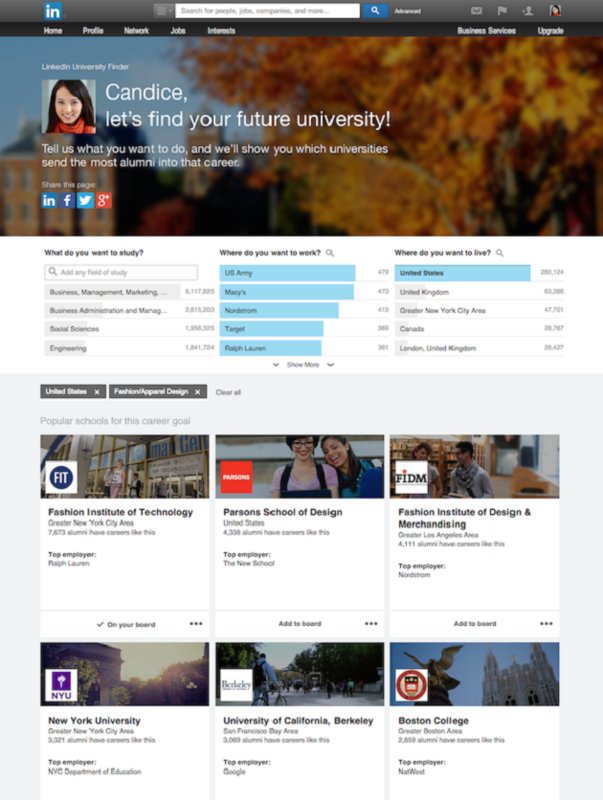 In addition, LinkedIn has introduced University Outcome Rankings, which is a tool to show how universities stack up across a variety of careers. According to the social network, the school rankings are based on millions of alumni profiles and the ability of recent graduates to land desirable jobs. 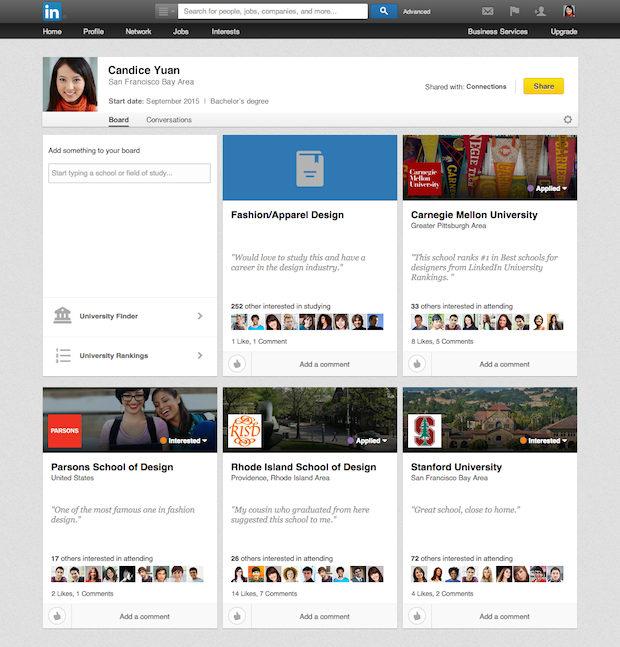 For a more personal experience, however, LinkedIn launched the University Finder tool, which allows students to imagine very specific careers and identify the schools most attended by LinkedIn members already working in that career. “By clicking the interactive graphs, a student can try out a possible career: ‘I’d like to study engineering, then work at Google or Apple, and live in the SF Bay Area after graduation,’ then see school results update with every click,” states the LinkedIn blog post. It is important to note that LinkedIn also revealed a tool called Field of Study Explorer, which helps students discover majors across a wide range of careers, as well as University Pages to help students learn more about the schools they are considering attending. With these new tools, it is clear that LinkedIn is looking to engage a younger market. In doing so, the social network is positioning itself as a helpful tool from the time students are ready to think about college to the time they are looking for their first job.